Sekino grew up near his mentor Shikō Munakata, and later studied under Kōshirō Onchi (Sekino printed Onchi’s portrait of Hagiwara Sakutaro). Beyond woodblock printing, Sekino was also highly accomplished in etching and lithography, and taught at the Pratt Institute in New York and at the Tamarind Lithographic Workshop in Los Angeles. 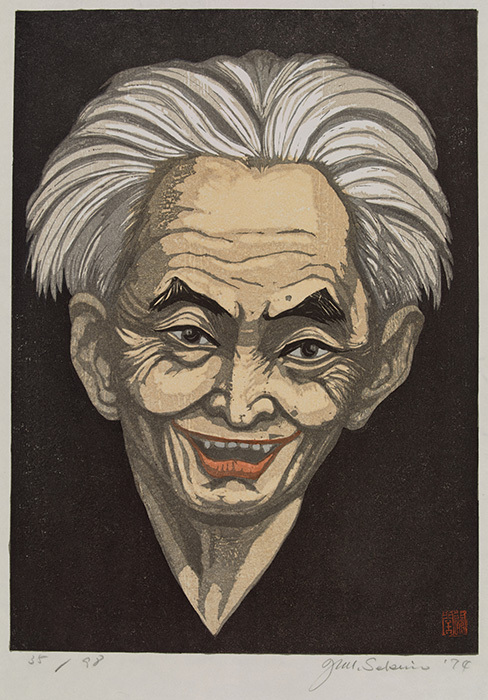 Sekino’s technical competency as a printmaker is reflected in this nuanced portrait of the Japanese novelist and short story author Kawabata Yasunari (1899-1972). Kawabata, the first Japanese recipient of the Nobel Prize in Literature (1968), was admired for his spare, lyrical prose and committed to translating Japanese literature into other languages for Western audiences. Sekino realistically captures the face of his spirited subject in a broad color range, printed from a large number of blocks. Kawabata’s face emerges from a pitch-black background which perhaps alludes to the author’s death by suicide in 1972. Junichirō Sekino was a largely self-taught artist whose fame brought him to the United States as a teacher of woodblock printing in the 1950s and 60s. Sekino was best known as a skilled portraitist (see his Portrait of Kawabata Yasunari nearby), yet he also created images of the theatre, the natural world, and landscapes, some of which he based on Utagawa Hiroshige’s Fifty-Three Stations of the Tokaido Road. 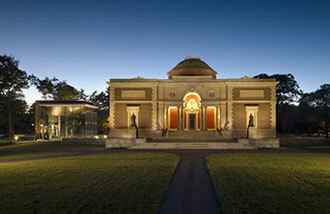 Sekino’s images of architecture that he carved in response to the famous series from the 1830s are similar to this work. 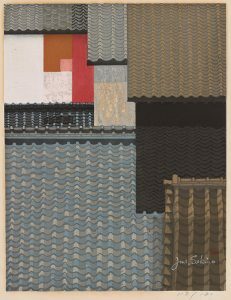 The flat areas of color and differing textures in Rooftops of Nagoya show the artist’s affinity for geometric shapes and repetitive patterns. As with many of his prints, Sekino uses an economy of design to reduce a city view to near abstraction.